The last section! I actually stalled even longer before starting this last section; it took me 8 days after finishing Beauty and the Beast to get going on Bambi. I wanted to make it last, but at the same time I wanted to get it finished. I was getting sad that it was almost over, and in addition to having no idea what to do with the completed puzzle, I had no idea what to do with myself when the puzzle was totally assembled! Nevertheless, I was excited to assemble the last section and it looked like it was going to be fun. Spoiler alert - it was! Once the filmstrip and the twinkly edges were mostly done I wanted to start with Flower; he's my favorite character from the movie and is so adorably cute! 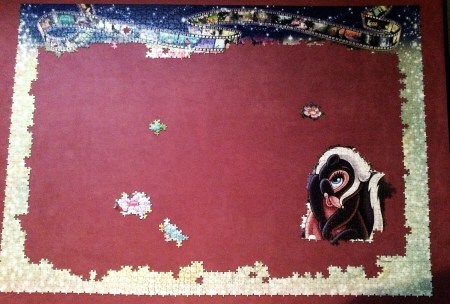 It may not look like it, but Flower is over 200 pieces - it's so difficult to tell the scale from these pictures. My mother always commented when she came over that it was so much more impressive in person because you just cannot tell from the pictures how large it actually is. The picture above is about halfway through this section. 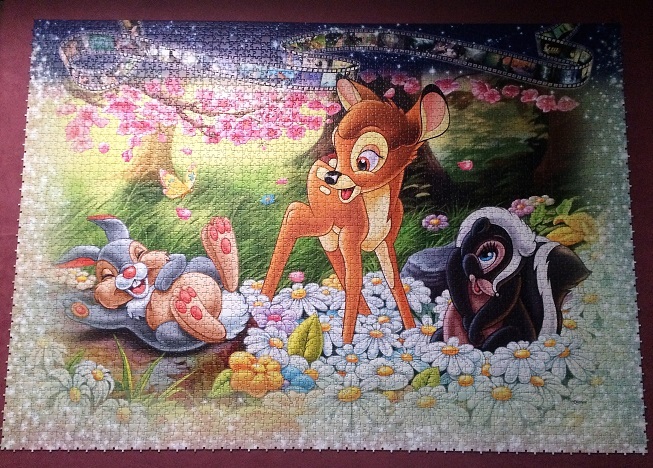 Thumper and Bambi were so adorable and seemed so easy to assemble that it went very quickly. Thumper is also connected to both the edge and Bambi, it always made me happy to get smaller sections connected together. 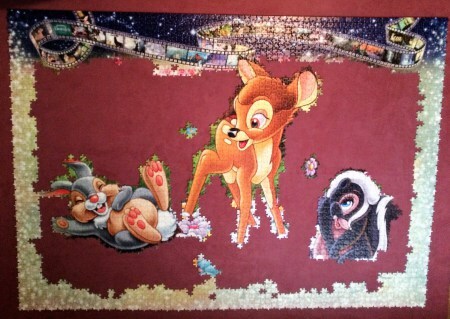 Bambi seems so large in this image; I was surprised that most of his legs were only 2 or 3 pieces wide. I keep saying it, it's just so cute! Things are filling in beautifully and looking amazing. The colors are much brighter in person, but I had to turn off the overhead light to reduce the glare for the pictures. The pink flowers on the tree are absolutely gorgeous, and were so much fun to put together. The pale yellow under the tree and the grass was easier to assemble than I thought they would be and went pretty fast. The entire section was so fun to assemble that it seemed to be going TOO quickly. I did it! All 10 sections of this gigantic puzzle are finished! This section took 17 days to finish, but I was consciously trying to stretch it out and make it last (and I really didn't want to finish on April Fool's Day) The whole image is bright and colorful and was great fun - but it made me sad at the same time. What do I do with myself now? We had to rent the hall at my parent's church to have enough room to put this monster together. I don't know about you, but I didn't have any free space in my house that was over 23 feet long and over 6 feet high! I wanted to be sure the special people in my life were able to be there for the unveiling, so although it was completed on April 2, 2017 it wasn't completely assembled until the middle of June. 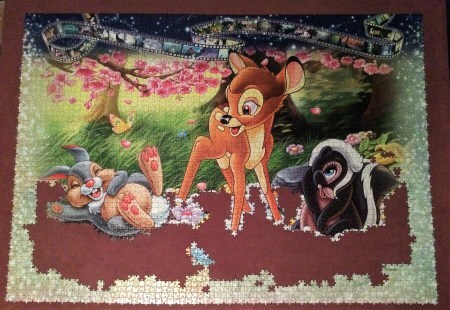 If you'd like to see the day to day assembly of Bambi click here to see the day it was begun and keep clicking next to watch it come together daily. The last part of this series is up next - final assembly day. 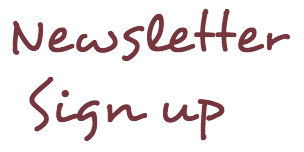 You don't want to miss it!